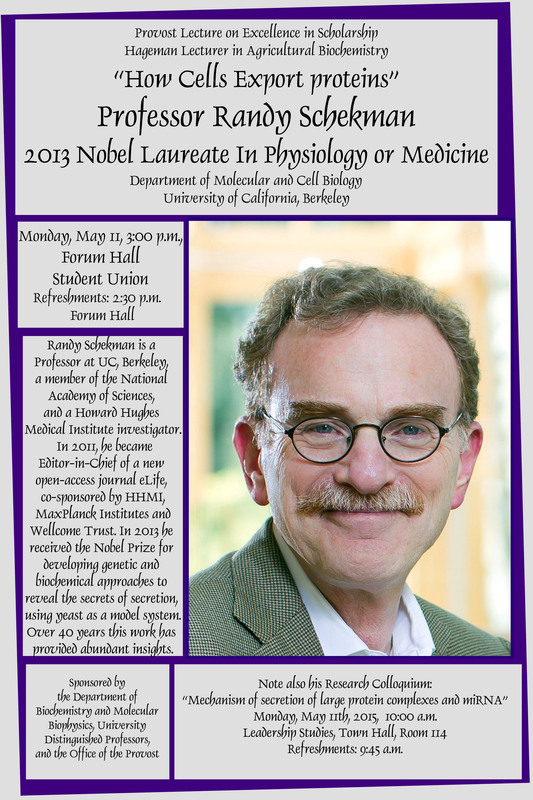 Once again our department will be hosting a very special seminar speaker, Dr. Randy Sheckman, from Berkeley, Nobel Laureate of 2013 in Physiology or Medicine, for his work on protein trafficking and secretion in eukaryotic cells. I am of course delighted that Phil accomplished all the negotiations needed to pull off this type of event. It’s not easy, many hurdles must be dealt with. But his power of negotiation is quite unique and hard to resist. For instance, the first time he hinted at the idea of us hosting a reception in our home in honor of Dr. Sheckman, my answer came quickly: No way we are doing this. Forget it. In your dreams. I don’t want to hear anything about it again. I inform you that said reception will take place at our home on Monday, and all faculty members interested in meeting Dr. Sheckman were invited to show up. This weekend, yours truly will be found pacing frantically around the kitchen, preparing for the big event… I have a few things planned, some a bit daring, some inside my comfort zone. I am actually super excited about it, and intend to have a great time getting ready for it! Stay tuned for a full report sometime in the near future… (assuming my mental sanity is not compromised). Good luck on the reception, but I’m sure you’ll do an amazing job! I’m so certain that you will “nail” this, and have a fantastic time doing it as well. Good luck, S. Look forward to reading about the menu. Hope Dr. Schekman likes cauliflower! I hope both the talk and the reception are a great success. We are really excited about it all… I am sure the conference hall will be packed! I am sure you will cook up a wonderful feast. Congratulations! THank you! I am still a bit nervous about it, but… I know how it goes. People start arriving, it all gets in motion, and I intend to have fun too. Nothing worse than a stressed hostess, right? That can really ruin a party. I am not going there. What a memorable and fascinating opportunity in so many different ways. Methinks you have the timetable worked out to a fine art: will be keeping fingers crossed that you too will manage to have an enjoyable time . . .
THat’s exactly what I want… to enjoy it myself too. I tend to worry a lot before, but I know I can relax while it’s happening. As you said, it is a fascinating opportunity. So let’s grab it! You had me hooked with ‘protein trafficking and secretion in eukaryotic cells’. 🙂 You will be in your element for this reception. They will love your food, you will love talking with Dr. Schekman and the room will light up every time you enter from the kitchen. Have a wonderful time and congratulations to Phil for using his excellent negotiation skills. I’m sure your event will be an A+, wish I were there to see you WOW them all in person! Oh my… I actually wish I had you here to run the show.. THAT would be awesome! I can’t wait read all the fine details and I hope you have a fantastic experience. VC vai arrasar Salete. Tenho certeza. Se eu pudesse, pegava um avião e ia assistir ao vivo. Já li os papers dele, mas adoraria ve-lo falar. BJ e boa sorte!!!! Que pena que Manhattan e’ tao longe de Sao Paulo e’ ou nao e’? Um dia vamos ter tele-transporters a la Star Trek… seria maravilhoso! Oh that is such a wonderful story, even though I know nothing about protein trafficking! I’m sure you’ll be a superstar. How many brilliant women like you are so multitalented? Looking forward to reading about this exciting weekend,you will make it a success just like anything else you embark on! You brilliant, beautiful lady, good luck! his talks were amazing, and he was a fantastic guest to have around, very personable and great with the students too. so many things to blog about, so little time! again, thanks for your comment, made my day! How did the dinner go? I have no doubt you pulled off an incredible meal and hosted a delightful party. 🙂 How exciting!!! Congrats to Phil as well for arranging such a prominent guest!